National Lumber is proud to announce that the company is listed at #23 in the United States on the 2010 ProSales Top 100 List. We thank our customers for helping us to achieve this level of recognition, and are pleased to show you the strength of the supplier you rely on to serve you. 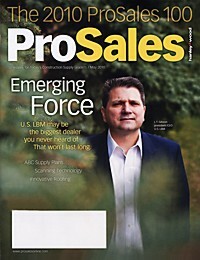 The ProSales 100 is a ranking of the nation’s top residential construction suppliers and distributors that participated in the 2010 ProSales 100 survey. While National Lumber is pleased to be recognized in this manner, our main goals are the exceptional service and great performance our customers rely on to meet their business needs every day. The size of our company is a function of providing our customers with a strong company that offers a wide selection of products at competitive pricing, related services that save time and money, and flexibility in meeting delivery needs and keeping our customers’ projects on schedule.